There will be a lot of my work on the website because I always scan my paintings as soon as they are completed and I therefore already have a handy pool of stuff to put on the website. 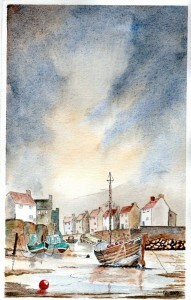 As others let me have copies of their work I will add it to their page. 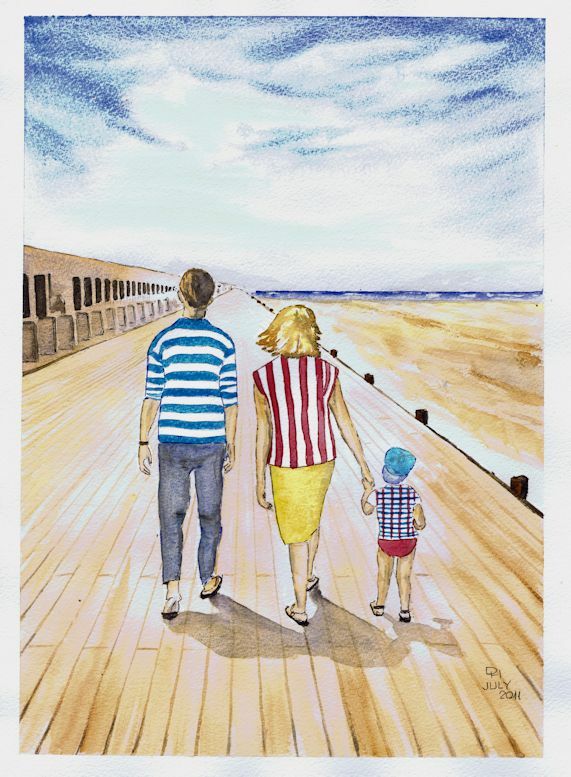 They have done some wonderful art between them….. But for the meantime you’re stuck with lots of mine. I’m not a good artist (if “artist” is the correct word to use), but you know what they say about an infinite number of monkeys with typewriters….. you do enough and you’re bound to get some right. My main goal I suppose is to try a range of subjects and styles……. and I’m having some success……just some. I have started putting my newer paintings at the top of the page but some of my favourites are further down……. have a quick look…there’ll likely be a long story attached to most of them. 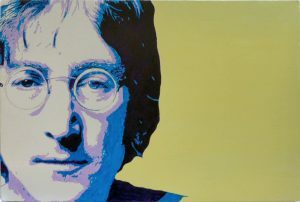 “Imagine” – Acrylic – approx 50cm x 60cm – Strangely I didn’t think of “Imagine” the song… it was more “Imagine what John Lennon would be doing if here here today…. he’d be an environmentalist or helping some other worthy cause”…and then, of course, I made the connection. While I was painting it all the adults said “Oh…John Lennon” and all the kids said “Oh….Harry Potter” It’s a sign of the times I suppose….but I think I know what my next one will be. 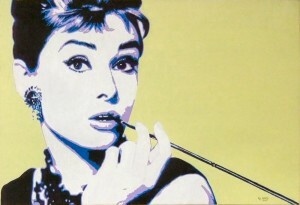 “Breakfast with Audrey” – Acrylic – approx 50cm x 60cm – I know that it’s an oft painted iconic image….. but I fancied having a go. I like my choice of colours….I used complimentary purples & yellows to enhance the already striking image. “Satchmo” – Acrylics – approx 50cm x 60cm – I liked this subject and the painting turned out much as I’d wanted to but since finishing it I can see how I could have done it better. Ain’t it always the way. Still….. it’s a cheerful addition to my paintings. “Clint…….at Last” – Acrylics – approx 50cm x 60cm – Yes, well…… it has the “……at last” tag because this picture has taken almost 12 months to complete. 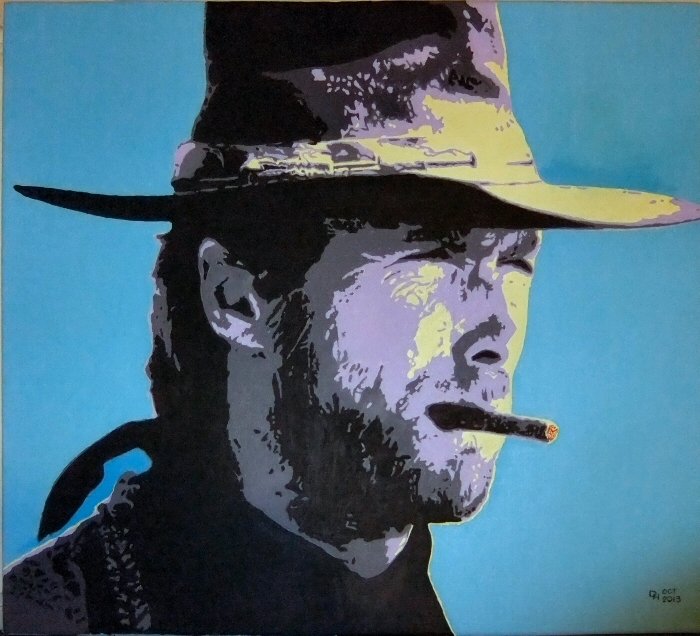 As you can see, it’s a pop art of Clint Eastwood and I started it as a live painting demo at Westhoughton Market on the 24th November 2012 as part of a Community Network event. 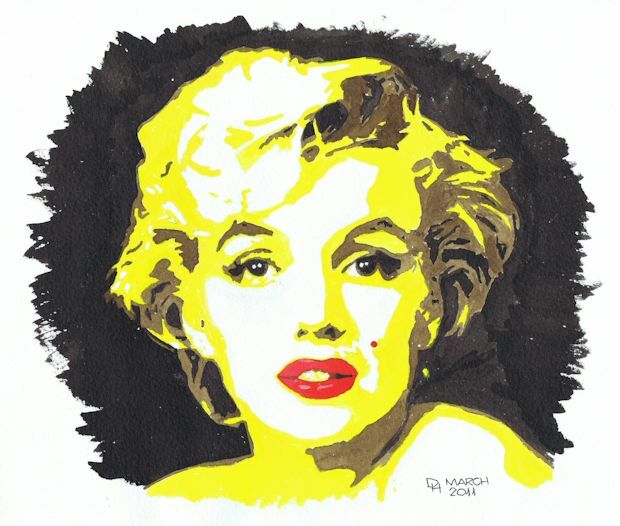 The main problem was that I’d committed the schoolboy error of not using the mix of acrylic paint (that I’d produced for the next to darkest tone) quickly enough ……and it dried out. That’s almost as foolish as not mixing enough in the first place. The truth is that when that happens you’ll rarely, possibly never, mix exactly the same colour again. To make a long story short, I took about 6 months trying to mix the same colour somewhat successfully, but only after I’d tried a completely different colour first and then deciding that I preferred the original. So……. lesson learned……. mix enough and use it while it’s still workable. I don’t think it ended too badly though. 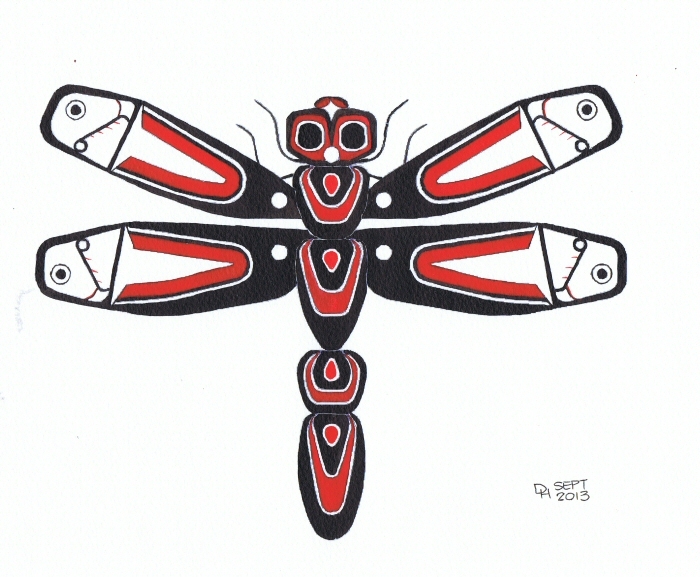 “First Nation Dragonfly” – Acrylic Ink – approx 35cm x 25cm – “First Nation” is the way that Canadians refer, in their respectful way, to the native people of North America. This painting is done in their style and I pay tribute to those people. This is intended to be the first of possibly 3 or 4 pieces that will show Dragonflys in different styles. 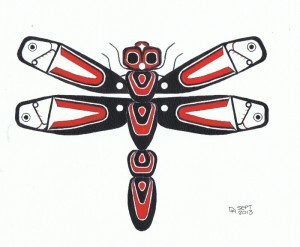 I intend creating one in an abstract style and another in an Aboriginal style. Watch this space as it takes me ages to do any paintings. 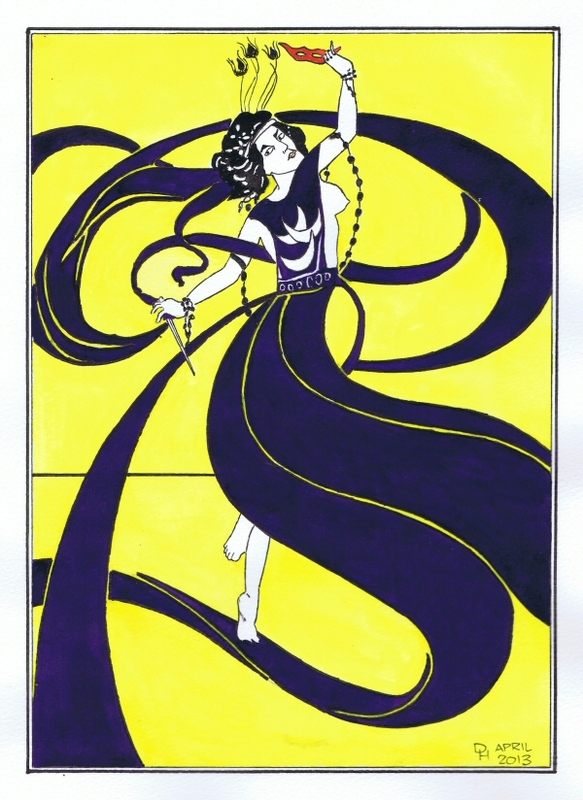 “Salome” – Gouache – approx 30cm x 21cm – This is another inspired by Aubrey Beardsley (although there is some debate as to whether the picture I used as a reference is, in fact, one of Beardsleys) – In any event….. this is my coloured rendition of a a black & white original that I’d admired. It needs a little extra work yet as the colour isn’t yet even and so will need another coat I think. 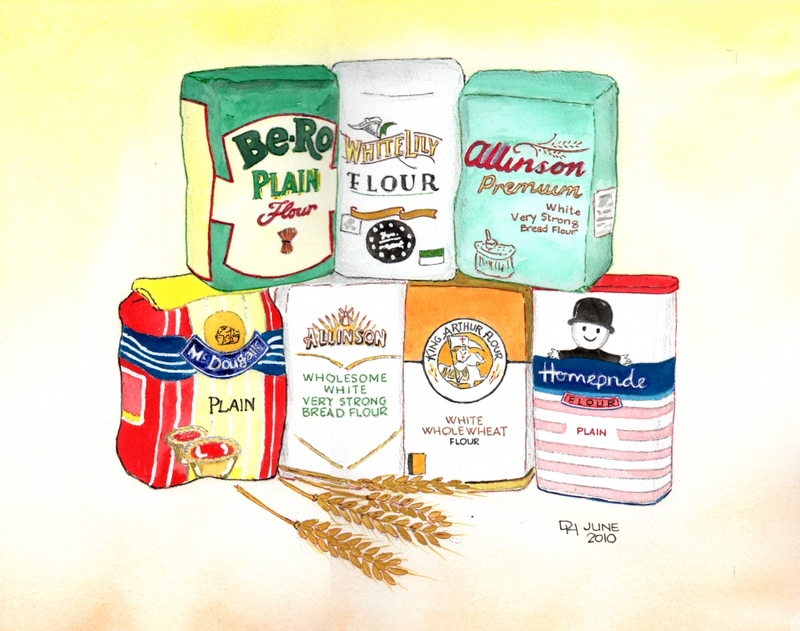 “A Bunch of Flours” approx 35cm x 25cm – who said that I’m not a romantic? I thought about doing this about 12 months before I finally painted it. The thought of it made me smile at my own weak sense of humour. Still…..you gotta laugh. It is about 12″ x 10″ and done in Gouache, Watercolour, pen & ink and pencil…… I really need to get a grip. “Freedom” – approx 35cm x 25 cm – watercolour – this painting is one of a batch that was inspired by thinking of an emotion and then trying to paint a picture that I felt best represented it. It was also a good lesson to me about not giving up on a picture as when I did the initial background wash I really made a mess of it and felt like putting it in the bin. Once I’d realised that I nothing to lose I just applied lots of water and re-painted the background wash and found that I was pleased with the result. The lesson I suppose is to loosen up and don’t worry….. the painting will usually pull together with the last 10 percent of the work. That’s when you’ll add your “dark’s” (ie shadows, lining in etc) and your painting will be transformed. “Trust” – approx 21 cm x 28 cm – watercolour. 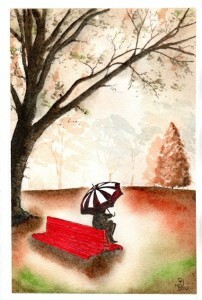 This is another example of a painting to illustrate a particular emotion. I had been having difficulty with inspiration so I wrote down a number of words such as “Freedom”, “Waiting”, “Genetics” and then “Trust”. Try as I might I couldn’t think of how I would represent the emotion until one day I was out walking with one of my two beautiful granddaughters, Eleanor (the other is called Emma). We were hand in hand and I thought “just look at her……she’d follow me anywhere”…. and there you have it…. a child’s unconditional trust. 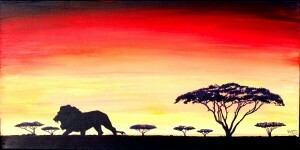 This painting represents that moment. “Shower the People” approx 35 cm x 25 cm -watercolour & acrylic ink. 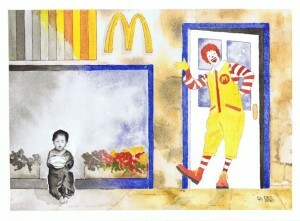 This is one of a series of paintings inspired by song and albums titles. 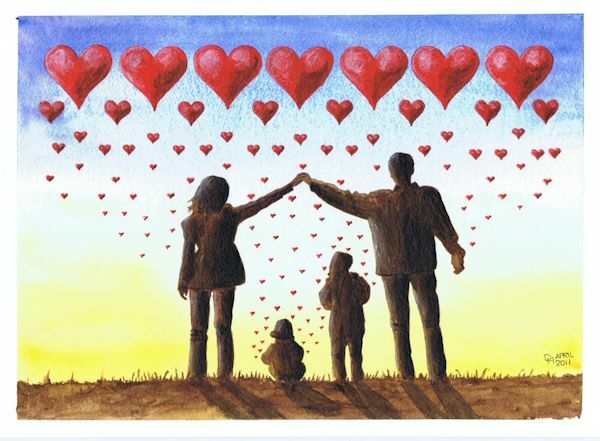 This one is by James Taylor and has the refrain “Shower the People you love with love” which is one of my favourite songs. You’ll find good versions on “YouTube”. This painting is dedicated to my cousin Edith in Canada who has had so many challenges in her life with her health and bereavement. All my Canadian family are lovely but she epitomises a fighting spirit coupled with a lack of bitterness along with such a positive attitude that it leaves one feeling humbled. 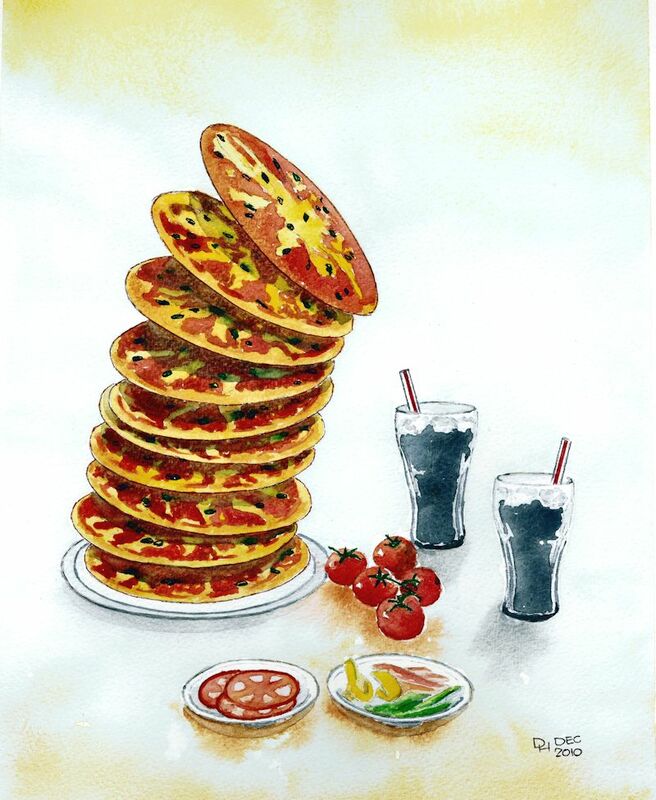 “Leaning Tower of Pizza” – So…… you thought that you were safe from very poor puns after “a Bunch of Flours”…….well, there’s no end to the torture. Here we have the geographically and culturally challenged “Leaning Tower of Pizza”. 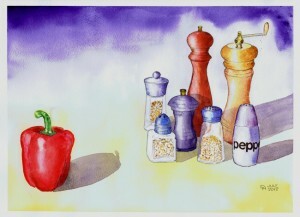 It is approx 25cm x 35cm in watercolour and shows you the consequences of listening to the voices in your head……. bad things happen. Still…..
… it made me smile……. poor demented fool that I am. “Life is not about waiting for the storms to pass…..”– Watercolour 18cm x 28cm I know that it’s a long title……but it could have been longer …lol. I saw this quote some time ago and although some may think it is a bit twee I think that’s it’s a good philosophy for life. Credit goes to the unknown creator of the photo that inspired me to do the painting. 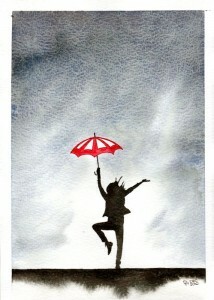 The quote “Life is not about waiting for the storms to pass…it’s about learning how to dance in the rain” is generally credited to Vivian Greene (although it can vary). This is another idea that I’ve been waiting the enthusiasm to “have a bash” at. “Raindancer 2” – Acrylic – 25cm x 50cm – this is the first painting that I have completed in 9 months……. and it’s a repeat !! I wanted to get some practice at acrylics as it is one of the many things that I’m not too good at, so I decided to re-do a previous subject to help highlight the difference in techniques needed between watercolour and acrylic. 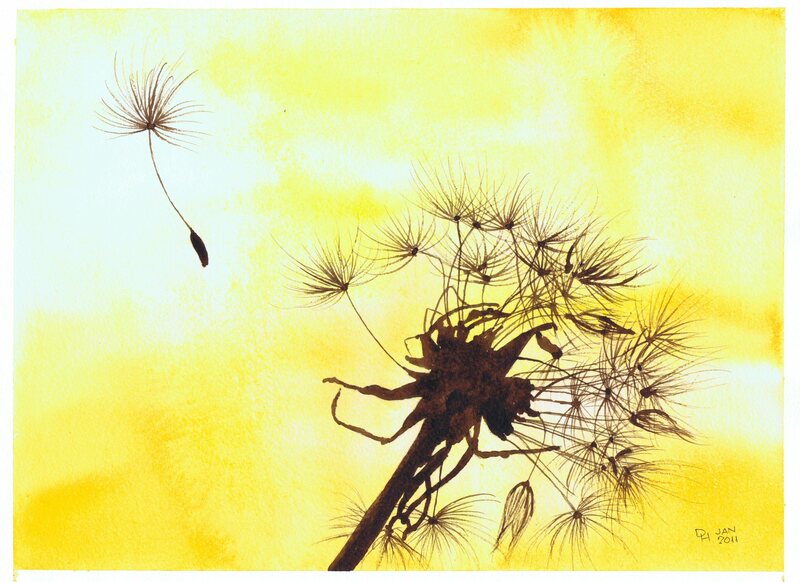 I did the other (shown above) 14 months prior to this one……..and I think that it looks effective in both mediums. “Genetics”- Watercolour & pen approx 25cmx35cm (10”x14”) 140lb Bockingford. 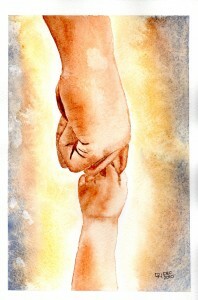 Another (this time comical) “One word” painting (eg “Trust” “Freedom” etc) that I’ve been doing. For those who know me then you’ll understand my weak sense of humour and see the poor visual pun of the T shirts. Credit goes to the unknown photographer who created the original source picture. “Waiting” – I saw a photo and it struck me that it said so much so I decided to have a try and create an emotion rather than just a picture. I’m not sure that I achieved my goal but I’m quite happy with the result anyway. I started trying this idea with my painting. I suppose I wanted to make people say “If only that bench could talk” Watercolour 17cm x 28cm. 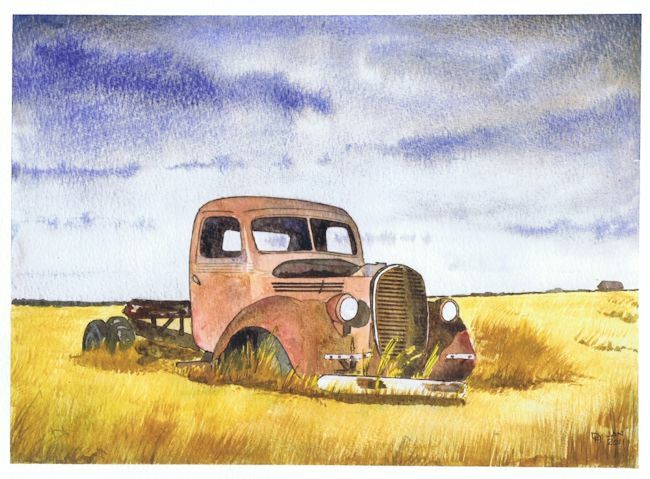 “Rust Never Sleeps” – Watercolour 200lbBockingford 34cm x 26cm –Another in a series of paintings inspired by songs, artist & albums. This is the title of a 1979 Neil Young album. I thought of the title first then explored what I felt could represent it. “She’s Gone”– Watercolour 17cm x 25cm on 140lbBockingfordAnother in a series of paintings trying to show emotions graphically…which is what it’s all about I suppose. 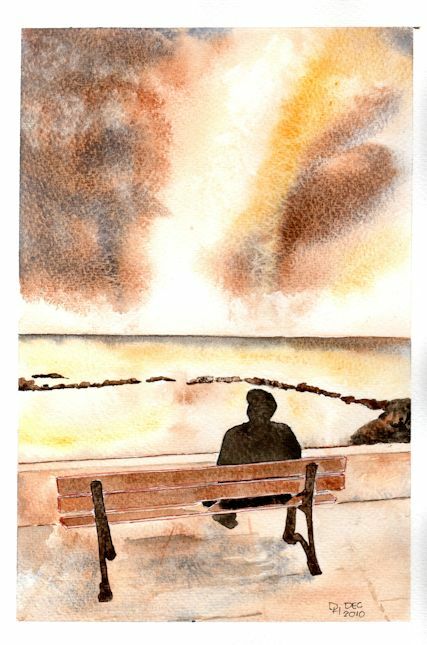 This was originally entitled “Loneliness”, well I started it with view to it being called “Loneliness” to go along with a few other paintings that have feeling only when I’d finished it that I realised why it disturbed me……it was because it described my feelings about the death of my mother, or “mam” as she was referred as. The hand on the bench shows that there is someone missing……. someone who should be there…….. someone who’s existence is central to that person’s life. That was my Mam…… she was, and is, my hero…….she taught me so much by her examples….lol….. she had a flying lesson as a present for her 70th birthday, she went parascending off the back of a boat in Portugal when she was 71, she rode her new mobility scooter at the fastest speed it had just to see what it was like…….and she laughed like a drain….so yes, I was forced I suppose to re-christen it “She’s Gone”. This is not maudlin or morbid…. just self revelation I suppose. 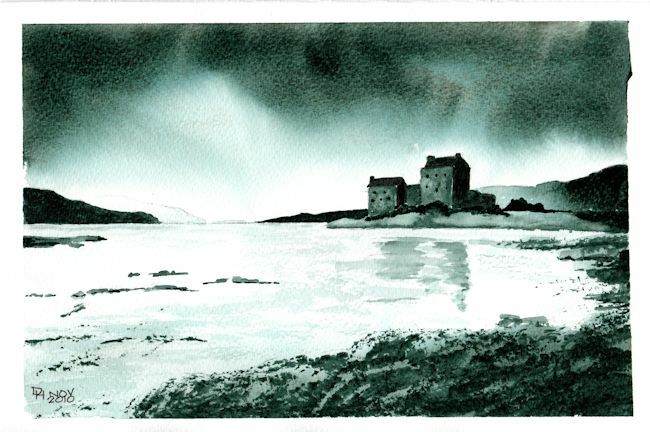 “Eilean Donan Castle” -Watercolour 27cm x 18cm. 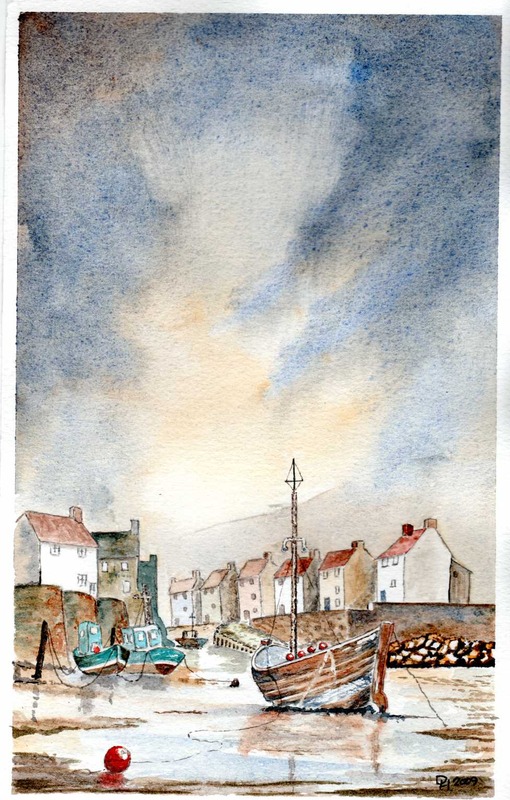 I thought that I’d have a try at using one colour…..well, it’s a mix of Phthalo Blue & Burnt Umber. The subject is Eilean Donan Castle at the Kyle of Lochalsh. It’s where part of the movie “Highlander” was filmed. 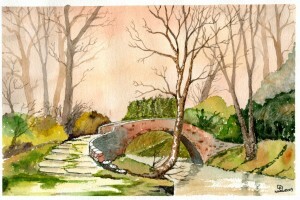 “Beggars Bridge” – Watercolour approx 35cm x 25cm – This painting is after another of the fantastic paintings by Rob Wilson…… I hope that I have done it justice. – Beggars Bridge is part of a true story of young love. Around the time of the Spanish Armada (1588), Tom, from a poor family, asked if he could marry Agnes Richardson who was the daughter of a local landowner. This all happened around the East Coast of England in the area of Scarborough. Mr Richardson agreed that if Tom became rich then he would allow the marriage (not thinking that he would ever be able to escape from his humble background). Tom eventually joined the English Fleet but when he went to say goodbye to his beloved Agnes he found that he could not cross the river (Esk) He later returned as a rich man (after serving with Sir Francis Drake) and married Agnes, became Lord Mayor, and had a thriving shipping business …….. he decided to build a bridge so that future lovers could cross in safety. “Soweto Shop” – Watercolour – approx 25cm x 18cm – This was part of a college project entitled “Urban Landscapes” (in watercolour) and I felt it said a lot about the eternal presence of the multinationals. 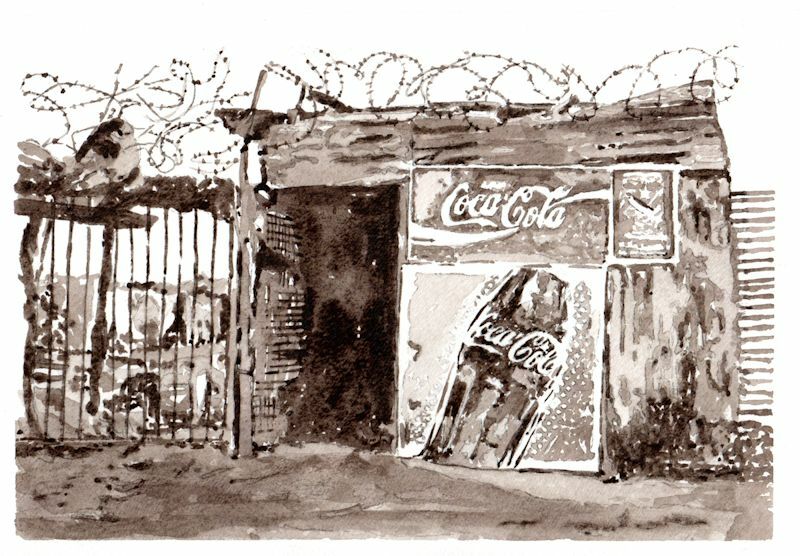 I did another version with the Coke advert in bright red. 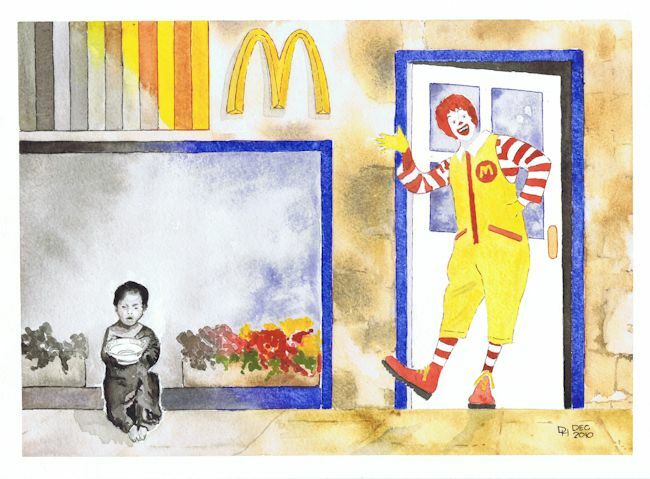 I have painted a number of what could be considered “political commentary” type pictures, only 2 are shown here (the other is “Poverty in a Rich World”) That’s the nature of creativity I suppose….. follow what moves you. 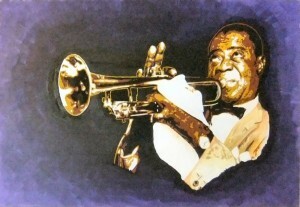 Sounds a bit pompous I suppose, but there are some pictures I really want to paint…. others I know will look good…. but they’re not always the same subject. 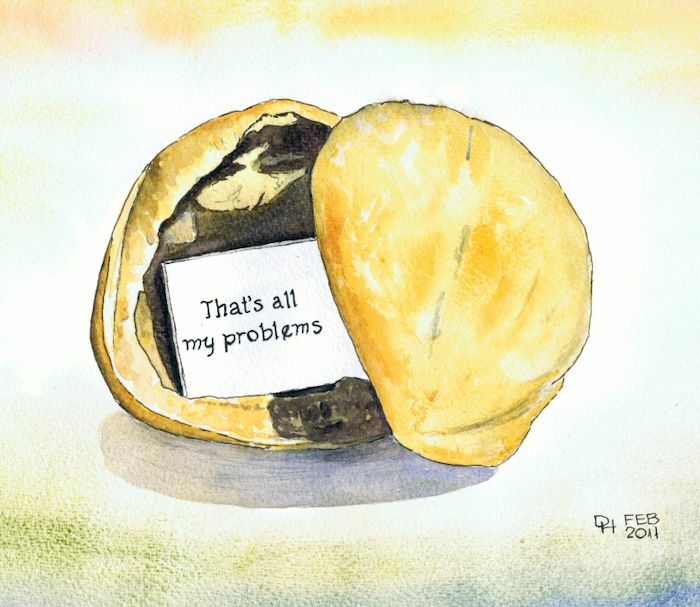 “That’s all my problems in a nutshell” Watercolour – approx 35cm x 25cm – Those who cannot quite see what it says on the slip of paper inside the nut are the lucky ones…..because it says “That’s all my problems” You see….. the devil really does make things for idle hands to do. 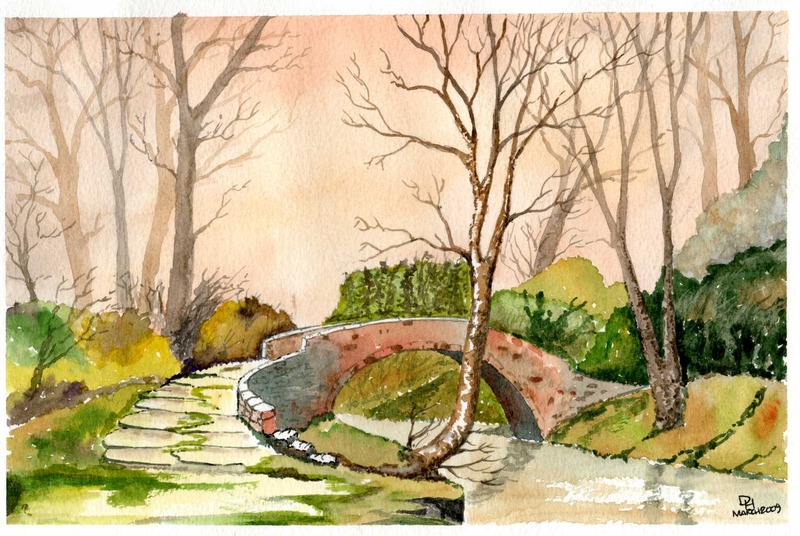 “Bluebell Woods” – watercolour – 27cm x 13cm – this watercolour actually has a look of being done in oils when in fact I just whacked the paint on thick to create the illusion. 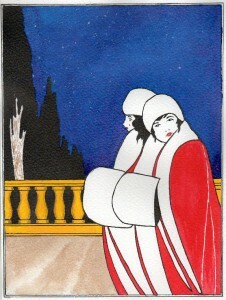 I quite like it and it is actually the oldest painting of mine on here. 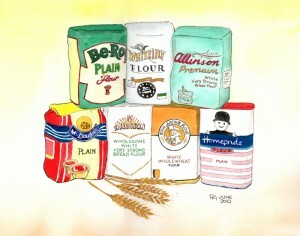 I like to think that I paint a wide range of subjects….not just landscapes. 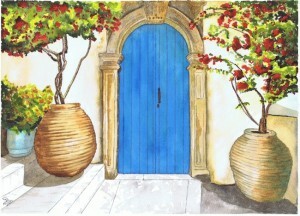 “Doorway in Cyprus” – 35cm x 25cm – Watercolour. This was taken from a postcard that I bought in Cyprus so credit to the unknown photographer. I’d tried to take a photo of the harbour at Paphos without any luck as it was always full of people and I couldn’t get a decent shot. So…..I decided that I’d look for some postcard views instead….. and this was one of them. 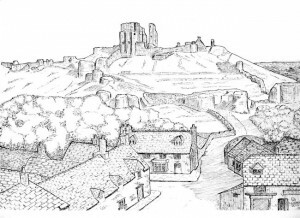 “Corfe Castle” – 25cm x 20cm approx – pen & ink – I thought that I’d have a bash at pen & ink and since we’d been to Corfe some years before and I had some photos, I thought that I’d have attempt that. I’m not sure that it’s finished…..you can twiddle about with them forever, adding bits here and there; but it’s as finished as it’s ever likely to be. 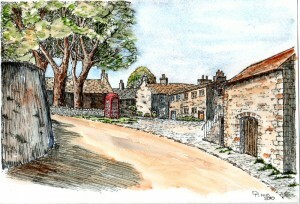 “Threshfield Village in The Yorkshire Dales” – 25cm x 20cm approx – Pen,Ink & Watercolour- After Neil Wingate. 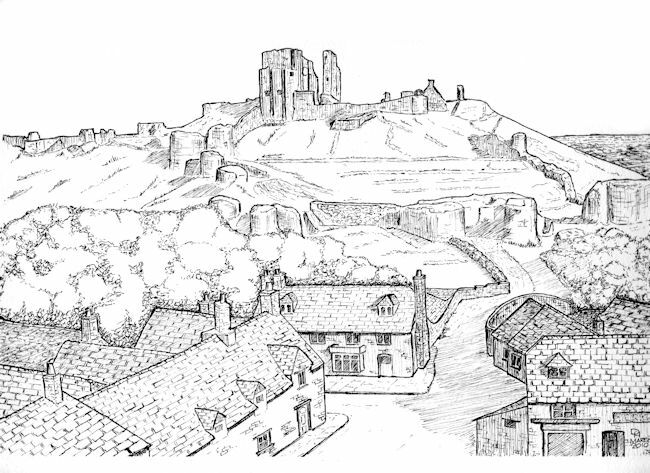 I’d seen a book that this artist had illustrated and decided to try and do a pen & ink as he had of this scene. I haven’t shown that version here but I thought that I’d like to see what it looked like with a watercolour wash on it….. and here it is. I think it turned out quite good. 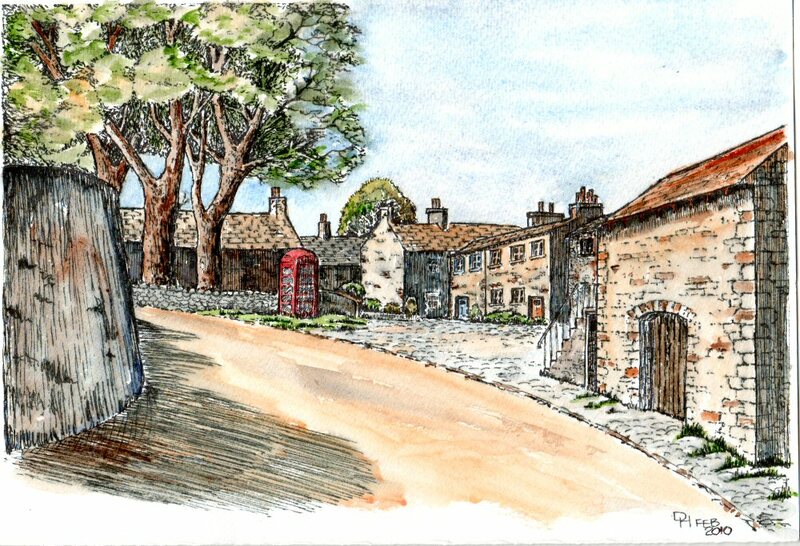 Of course, I had to go and actually see the place since I’d drawn/painted it….. so off we went toward Grassington and that beautiful part of the beautiful Yorkshire Dales. …..a good day was had by all. 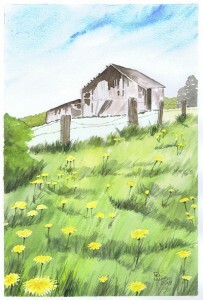 “Old Barn” – Watercolour – 22cm x 32cm – this is the first watercolour that I have completed in nearly 12 months. I’ve been a bit distracted…… I really must get a grip. Anyway….this was the subject of a session that we’d had at the art group about 2 months ago and I tend not to paint while the tutor is there as I am a bit dopey, so I’ve had a try at it since having found the source picture in my art bag. It isn’t good but it’s not bad either ………and I’ll settle for that. “Stained Glass Calla Lily” – Watercolour – approx 35cm x 25cm. I fancied trying something different and a couple of things came together at the same time: we had a tutor at the group (Judith Farnworth) who was encouraging us to add lots of very wet colour together and I’d seen a program on TV that showed a stained glass window. 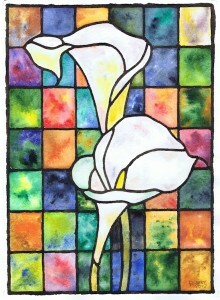 So…..I did this….each small panel is almost a painting in itself…there’s over 40 of 5cm x 4cm multi-coloured rascals. I quite like it though. “Benalmadena Stupa” – watercolour & pen – approx 35cm x 26cm – I haven ‘t done a very good job of this – sometimes you just get off on the wrong foot, but I wanted to put it on here as my older brother, John, told me about the place so I “Googled” it and here it is. 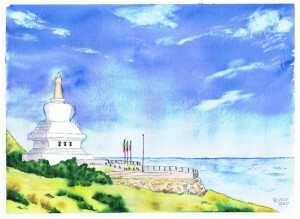 For those, like me, who don’t know what a Stupa is then you’ll be interested to know that it’s a Buddhist Monument…… this one symbolises the Buddha’s Enlightenment. Anyhoo……. it’s a landscape of sorts, which is a bit of a change for me. “Mixed Peppers” – Watercolour – approx 35cm x 25cm – another in a line of really bad puns (see “Leaning Tower of Pizza” and “a Bunch of Flours”….. all I can do is to apologise. The devil really does make things for idle hands to do. 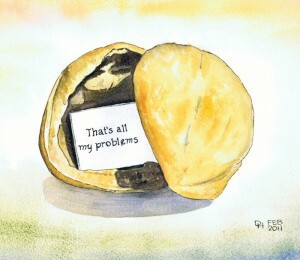 It makes me smile though…..and I’ve had it in mind for about 12 months….. painting it was the only way to exorcise it. “Beardsley’s Colourful Twins” – Acrylic Ink & Pen – approx 17cm x 22cm – This was an exercise set by Tina Martin at her art class and consisted of taking a source picture done by the artist Aubrey Beardsley. I chose his picture “Twins” and, as you can see, I added colour to it. Is it better?…..probably not…..but I’m pleased with the effect and I think that it’s still an interesting picture. I had painted the sky quite dark and Tina suggested that it had a look of a night scene so I sprayed white “stars” on using an old tooth brush and white acrylic ink.